Denver Dev Day is Colorado’s best, community-led developer event! Over 200 attendees, 24 sessions & speakers, and a cool keynote. Fun day, lots of learning, demos, food and prizes! Thank you for considering Denver Dev Day. Microsoft is a recurring sponsor for Denver Dev Day and has provided our venue space for nearly 6 years. We're grateful for their continued sponsorship; find out more about our great venue in the event site details. Denver Dev Day welcomes you. As a speaker at Denver Dev Day, you get the opportunity to speak to a thoughtful audience of bright technologists and eager developers from a thriving local community. This is our eleventh Denver Dev Day. Please note: Denver Dev Day cannot cover travel expenses. What level should your talk be? We think you should shoot for level 100 or 200. At most conferences level 100 and 200 sessions are the best for reaching the most developers. The same is true for Denver Dev Day. How many talks can I submit? As many as you like. We generally only choose one per speaker. If you are traveling to Denver, be sure to let us know. We'll consider multiple sessions for speakers traveling to Denver Dev Day. What topic should your talk cover? We have four tracks: Client, Web, Data and Cloud. If you can't fit your topic in one of those, consider Other. 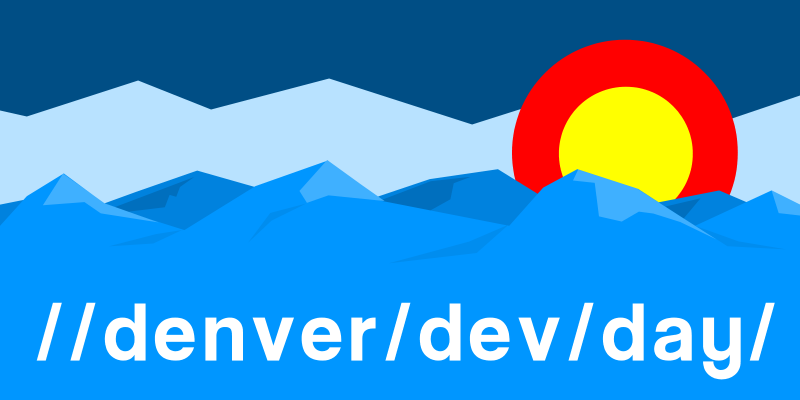 We're open to new ideas, but, remember the dev in Denver Dev Day is for Developer. Tip: we love talks on design patterns and development techniques. How long should your talk be? We have two session lengths: regular and lightning. Regular sessions are just under an hour depending how many sessions are accepted; lightning talks are 10 to 15 minutes depending on how many talks are accepted. We look forward to seeing your submission. Help! My Classes are Imbalanced! Azure Pipelines: CI & CD in depth.